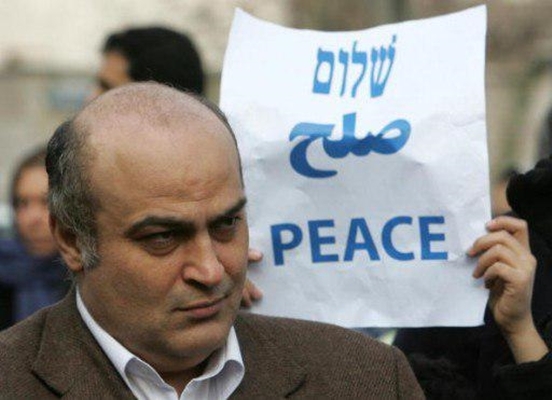 Undated photo of Siamak Morreh-Sedgh, the representative of the Jewish community at the Iranian Parliament, attending an anti-war demonstration of Iranian Jewish community. Siamak Morreh-Sedgh, the representative of the Jewish community at the Iranian Parliament, says Jewish Iranians have been peacefully living along with other Iranian people for around 3,000 years now. Morreh-Sedgh was born in the city of Shiraz in 1955. He graduated in medicine, and worked in Kurdistan province from 1995 to 2001. Afterwards, he worked as a technical expert at a pharmacy. He is now serving for a third term as the representative of the Jewish community in the parliament. The following are excerpts of his interview with ISNA where he has weighed in on the situation of the Jews in Iran, his memories of the days of the 1979 Islamic Revolution of Iran as well as the role of Jews in the revolution and in defending the country during the 8-year Iraqi imposed war on Iran in the 1980s. In the interview, he has also touched upon the difference between Zionism and Judaism, the origins of the Jews’ culture in Iran and their concerns and positions on the enemies’ acts of sabotage. Are there any differences between Jews in Iran and in other countries? As far as Judaism is concerned, there are not many religious differences between Jews in different parts of the world. However, all Jews across the globe cannot be categorized into one group, as Muslims cannot either. This applies to all divine faiths. Religiously speaking, Jews in Iran are followers of Judaism, and from a strategic perspective, they are Iranian citizens. Therefore, we fully abide by the laws and regulations of our country when it comes to politics and international relations. During the 8-year Iraqi imposed war on Iran in the 1980s, all Iranian people, including Jews, Muslims, and Zoroastrians, joined hands to defend our national values as well as Iran’s territory. It makes no difference to us whether our enemy is Saddam Hussein, Trump or Netanyahu. Whoever poses a threat to Iran’s national interests and values is an enemy of Jews, too. How do you evaluate the coexistence between Iranian people and Jews? Jews have been living alongside other Iranians for around 3,000 years now. In fact, Iran is one of the places where Jews have always had ease of mind as their homeland and have been able to have peaceful coexistence with Iranian people. Jewish Iranians have had an undeniable role in medicine and pharmacy as well as cultural issues such as music plus philosophy. Furthermore, several other things such as their costumes, eating habits and even ceremonies held on Jewish occasions have been inspired by the Iranian culture. Iran is one of the places where Jews have always had ease of mind as their homeland and have been able to have peaceful coexistence with Iranian people. What are the most important concerns of the Jewish community in Iran? They share the same problems that other Iranians have. At the moment, the most important issue and concern of the Jewish community in Iran, especially the youth, is unemployment, which is a problem that all Iranians have. How do you compare the situation of the Jewish community in Iran before and after the revolution? Emigration is a natural phenomenon that takes place after every revolution. In Iran, too, many people, including Jews, emigrated after the revolution. Interestingly enough, Iranian Jews’ abidance by Judaism has become much stronger after the revolution because a more religious atmosphere has prevailed across the country following the revolution. This impacts all communities and ethnic groups. Moreover, the emergence of some social issues has influenced the Jewish community. For example, divorce was considered a taboo in the Jewish community until 20 years ago. However, the rising divorce rate in the country nowadays has had an impact on the Jewish community as well. What is the Jewish community’s position on the current US economic war against Iran? The Jewish community is not separate from other Iranians. Iranian Jews who have stayed in Iran have no intention of emigrating to other countries and have always defended Iran as their one and only homeland and have shown their loyalty. We have experienced economic problems more severe than what we are facing today. I don’t think the intensity of the current problems, even the initial sanctions, are comparable to the events that took place during the Iraqi imposed war on Iran. How do you see the propaganda campaign launched by Western media against the rights of minorities, especially Jews, in Iran? in Geneva, and he finally confessed that the human rights situation in Iran is better than that in other Middle East countries, even by Western standards. Minorities have spontaneously held different ceremonies all the time to safeguard the ideals of the revolution, but unfortunately, such events have not been properly covered. When Leader of the Islamic Revolution Ayatollah Seyyed Ali Khamenei underwent surgery, prayers were held in all synagogues across Iran for the Leader’s health, but no report was filed in that regard. Another case in point is the Sepir hospital, which is the Middle East’s only charity hospital for Jews. It is also the only Jewish hospital in the world which admits all patients, Jewish and non-Jewish alike, based on charity regulations. More than 90 percent of its staff members and patients are Muslims. One of the Old Testament’s key statements is written on top of the gate of the hospital. It reads: “Love those of your kind the same way you love yourself.” It does not say “those of your religion” or “your brother.” Rather, it uses the phrase “your kind.” That means it would be enough to be a human. Well, has this been covered more frequently in Iranian or foreign media? The world’s safest synagogues are located in Iran. Even in Europe, synagogues are protected by security guards. Iran is the only country to have practically defended Christians in Iraq and Syria during the time when the ISIS terrorist group was at the peak of its activities. But where was this reported? At that time, I brought up the issue at the European Parliament. It is an honour for Iran that Christians in Iraq and Syria regard General Qassem Soleimani as a saviour. Asia’s oldest synagogue in Syria was targeted by ISIS, and Africa’s oldest synagogue in one of Tunisia’s islands was struck by the Taliban. This comes as the world’s safest synagogues are located in Iran. Even in Europe, synagogues are protected by security guards, including one from Mossad, who safeguards the building along with local security personnel and police. However, there is no need for the presence of police at synagogues in Iran. We only use police when we want to establish internal order at our synagogues. Where in the world can we see such security, and where have we covered this story? It would be naive to think the US secretary of state would tell the truth about minorities in Iran. I have said time and again that it would be pointless to respond to such individuals because their words are so repetitive that they are not worth being responded to. The only solution is that we ourselves should have an integrated system to promote realities.